What do I do while Jim is working (and exploring a bit when not working) in Alaska? I’m busy doing a lot of the things I would be doing if we were parked near a normal client site, and I attended the wedding that we had intended to take in together. 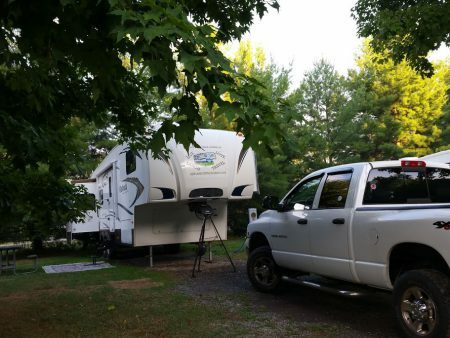 Living in an RV can be pretty much the same as living in a sticks and bricks house. To prove my point, here is an idea of what my week was like. Sunday, July 31 – Up early with Jim, he was delivered to the Cleveland airport to make his way to Alaska. In my blissful state of ignorance, I made my way back toward the Streetsboro/SE Cleveland KOA. Since it was rather foggy and I was hungry, I stopped at a Cracker Barrel on the route back and had a nice hot breakfast. It was a couple of hours before I had any idea of the hurdles he had to jump to get there. Back at the homestead (our 5th Wheel), I continued the process of setting up “home” for a two-week stay after feeding and walking Chewie. Then I downloaded pictures from our camera and wrapped up the post I had started on the 28th, so it could be posted. I made a “to do” list for the upcoming week, too. After that, I spent most of the day relaxing; it had been a pretty busy week. I also tried to catch up, by phone or by text/messaging, with family members. Jim let me know when was safely in Juneau and settled into his home on the roam: the hotel. Monday, August 1 – On Monday’s agenda was the following: Get groceries at the grocery store, do laundry (4 loads), pay bills (by mail and online) and get other financial updates, arrange for our mail to be forwarded from Tennessee to us here, go to an ATM to get cash (as I handed all of mine to Jim for his travel day), set up a rental car to drive to Cleveland (did not want to drive the big Ram truck in downtown over the weekend), and Chewie and I had a Meet ‘n Greet with his potential Dogvacay host for the weekend. I also got an email from Panera indicating they want to give me a free bagel every day in August, and lucky for them, there is a Panera about 3 miles down the road from me in neighboring Hudson, Ohio. I made a point that go there Monday morning, too. All jobs listed were completed Monday, so I felt very accomplished. 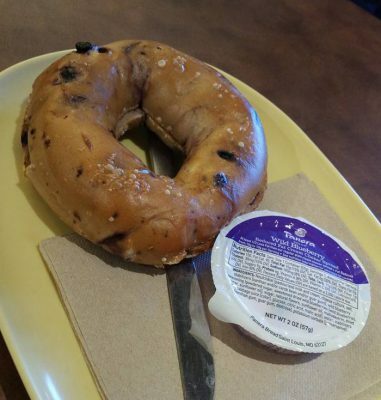 My free bagel on the 1st – I bought cream cheese. 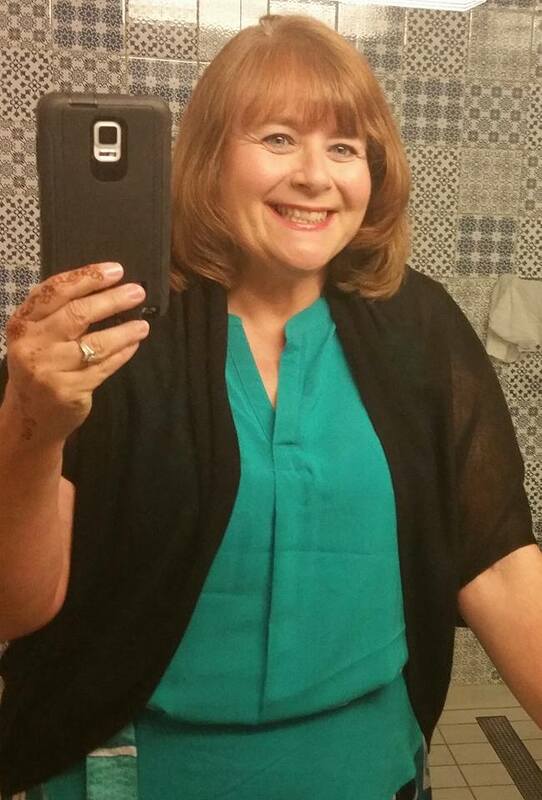 Tuesday, August 2 – This was designated shopping day; I needed clothes for the weekend wedding. Yes, I’ve known for months, but it just never seemed to be the right time to shop. Somehow or other, I was always busy, and Savannah, Tennessee, does not offer too many shopping options. I am so thankful that the mother of the groom, my friend Jan, did not mind me texting her so often. 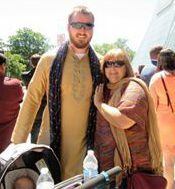 Neha, the bride (now wife) of Max, Jan’s son, is of Indian heritage, so I needed a lot of assistance to know what was appropriate. In hindsight, I wish I had taken a day to do this when we were camped near Wooster as I now know there are several shops for Indian attire closer to there than where we are now. It would have been cool to have my own sari to wear, but since I didn’t, I had to do the best I could, with Jan’s help. Also,Chewie’s Meet ‘n Greet went well, so I needed to also formally request the weekend Dogvacay and pay for that. Wednesday, August 3 – This was prepping for the wedding/pampering me day. After a quick run to a local store to add to my outfit options for the weekend, I found a nail salon. Lucky me! Wednesday was special price day for a spa mani-pedi, so I said, “Yes, please.” After that, I realized I had a craving for Chinese food, so I found a nearby restaurant with a lunch buffet. Then it was hair color time. I was prepping myself for the weekend, but since I knew Chewie would be playing outside often with other dogs, I needed to make his “spa” appointment for after the weekend. His is set at Petco for Monday at 11:30 a.m.
Thursday, August 4 – After a conversation with Nathaniel, our son who would be one of the groomsmen in the wedding, I realized that parking at the Westin in Cleveland is $30 per night, and some research showed me that all of the less expensive nearby parking garages, which could have spots reserved in advance, were full for the weekend. This necessitated some time in getting a new plan in order; I was not going to pay $65 and change for a rental car for three days and then pay $60 to park it two nights. 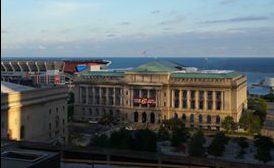 In the end, I was able to change my reservation to one way from Streetsboro to downtown Cleveland on Friday with a one way pick up in downtown Cleveland on Sunday to return to Streetsboro. The only glitch was that I’d have to wait until Monday for the return, but I would have no parking fees. I did have to pay about a $10 “drop” fee each way, and the car obtained in Cleveland was a bit more than the one picked up in Streetsboro, but when it was all said and done, I paid about $75 for my transportation rather than $125; I was good with that. There was one other errand to run. Jim had picked out a gift and card for our daughter-in-law, and I needed to prepare it for shipping and get it to the P. O. I got it done and out on Thursday. Had it waited until Monday, it may have not made it by her birthday. Last was packing bags for Chewie and me. Friday, August 5 – This was the first of three very busy but amazingly fun days. Last minute packing done, I got the rental car to drive into the city. Since pets were not allowed in the rental car, I had to take Chewie to his Dogvacay home in the truck, get him settled (he was excited to be back), and then come back to the campground for my things and the car. I wanted to get to the hotel before rush hour and before it might rain (which it did). This was accomplished, and as I was checking into the Westin hotel, the sweet groom found me. He was my bell boy, carrying my very heavy bag to my room on the 12th floor. I got settled and was thankful for the gift bag that included water and snacks since I had foregone lunch to get on into the city. Nathaniel and family were traveling, and I was in touch with them off and on all afternoon and evening. 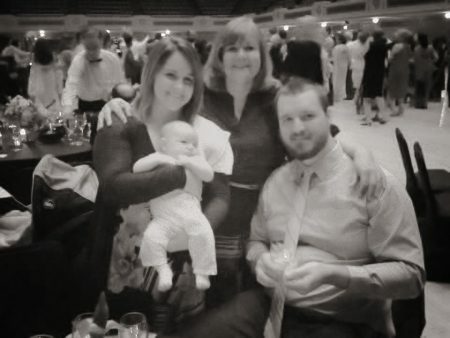 The learning curve on traveling with an infant turned an expected 8-hour trip into 13-hours. 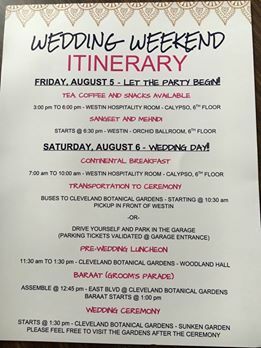 In the guest gift bag was an agenda, and I learned that something was going on all weekend long beginning at 3:00 p.m. that day for those who wished refreshment prior to the Sangeet and Mehndi, the dinner and party before the wedding. 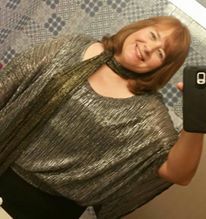 Friday night’s party was marvelous. 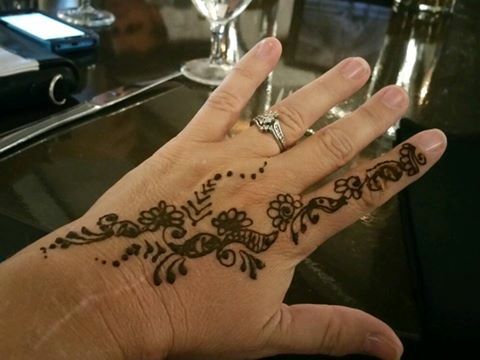 I was one of the first to get my henna hand tattoo as part of the celebration. I found a few friends I knew from Clarksville and Clarksville Academy, including some former students. I also met many new folks, some of whom sat at our table. Unfortunately, Nathaniel and family missed all of this, but as soon as they arrived, I left the party to help them get settled. Of course, I needed Grandma snuggles from Hershel. 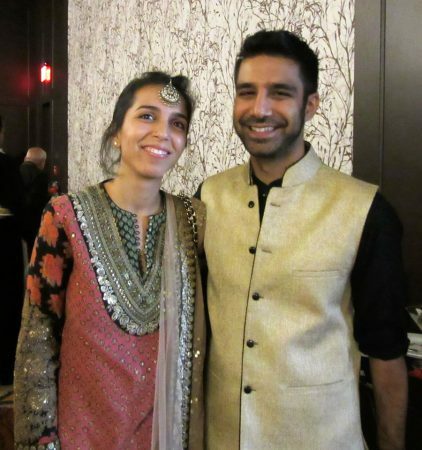 Saturday, August 6 – It was the big day, and Max and Neha got hitched in a fantastic way! A continental breakfast was served in a large meeting room on the 6th floor from 7 – 10. I ate early, and then I helped the “kids” with the baby, going back down when they ate. I was already dressed for the ceremony. 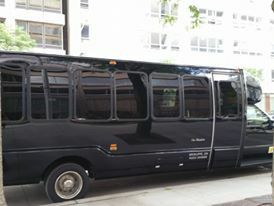 At 10:30 limo buses began transporting the wedding party and guests to the Cleveland Botanical Garden where a buffet lunch awaited. About 1:00 p.m., the Baraat, or Groom’s Parade, began. Although it was warm, the event was fun and exciting. After the parade, guests made their way to the location of the ceremony in the garden. Thank goodness it was 10 degrees cooler that it had been being, but the sun was still hot. As a few had done, I pulled two chairs back to shade, so Rachel and I could care for the baby out of direct sun. It was a good call. The service included both the traditional Indian ceremony followed by a Christian ceremony and lasted an hour and a half total. It was beautiful! I enjoyed it greatly. 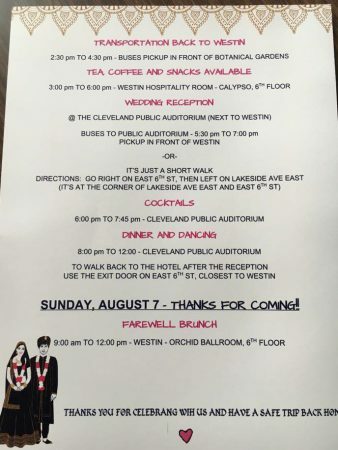 Then, we were transported back to the hotel where we had a little time to rest (or in my case, shower) and change for the more formal reception held in the Cleveland Public Auditorium and Convention Center. It was breathtaking when we walked in. I could write a whole post separately on the ceremony and on the reception – so much was seen and done in a beautiful and classy way. Our evening, though, was cut short when the music and dancing began in earnest. Poor little Hershel’s baby ears could not take it, so Nathaniel, Rachel, Hershel, and I returned to the hotel. Nathaniel really intended to get the baby settled and leave him with me, so he and Rachel could return. They were just too tired. Nathaniel had worked 50 hours in four days, had driven 13 hours, and had been out in the heat of the day for the ceremony after little sleep, but he so wanted to spend more time with Max, Neha, and their families. Here are a few (I made about 250 pictures) from the weekend. Click on a picture below to see caption. Sunday, August 7 – A farewell brunch was served from 9 a.m. to noon to guests in the same ballroom as was used for the first night’s activities. After I ate, I went up to help the kids get ready to go down. I said my good-byes and called for the rental car company to bring me my car. I felt honored and blessed to have been able to share in such a meaningful and auspicious occasion. I wish blessings on the new married couple and their families! Returning to the campground, I took our truck to pick up Chewie. He and I rested all afternoon long. Of course, I was in touch with family, especially to make sure Nathaniel and crew were making their way safely back to Alabama. It had been a big weekend.